Sugar Loaf’s name comes from the Portuguese Pão de Açúcar and is presumed to have been given to the mountain because of its shape that resembles a cone of sugar, a ‘sugar loaf’. This could be wishful thinking as it is far more likely that the name Pão de Açúcar was derived from the language of the Tupi Indians who called it Pau-nh-Acuqua, which translated as “high hill, pointed and isolated”. Man, or rather woman’s, first contact with Sugar Loaf dates back to 1817 when Henrietta Carstairs, a British nanny, became the first known person to successfully scale the summit. At the top she planted the British flag. In subsequent years to 1817 a series of other British and Brazilian climbers conquered the mountain and each time the flag changed to the appropriate nations. In 1851 the first known collective climb took place made up of American and British climbers that were led by John Burdell and included one woman and a ten-year-old boy. It is recorded that the group: “spent the night on the summit and celebrated with a display of fireworks for all the city to see”. Climbing Sugar Loaf is a popular sport today and each weekend a group can usually be seen clinging to the sides. It was, however, only in 1972 that four Australians finally conquered the North Wall, the last unclimbed route. There are estimated to be around 60 different routes to the summit. 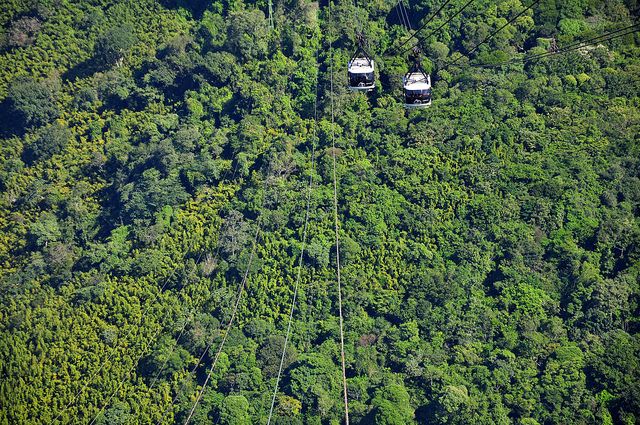 The idea for a cable car for Sugar Loaf was first thought about in 1908 by the engineer Augusto Ferreira Ramos. Along with the industrialist Manoel Galvão, Ramos signed an agreement on June 30, 1909, with the then mayor of Rio, Serzedelo Correia, to start work on the project. The Mayor of Rio was so skeptical that he gave Ramos and Galvão thirty years in which to complete the task. They needed less than four. The first stage, between Praia Vermelha and the Morro da Urca, was inaugurated by 50 members of the Carioca press on October 9, 1912, and by the general public on October 12. That Sunday, 577 people rode to the top of Morro da Urca and the Mayor gave permission for the company to raise the number of journeys made by the cable car to five in the morning and four in the afternoon. 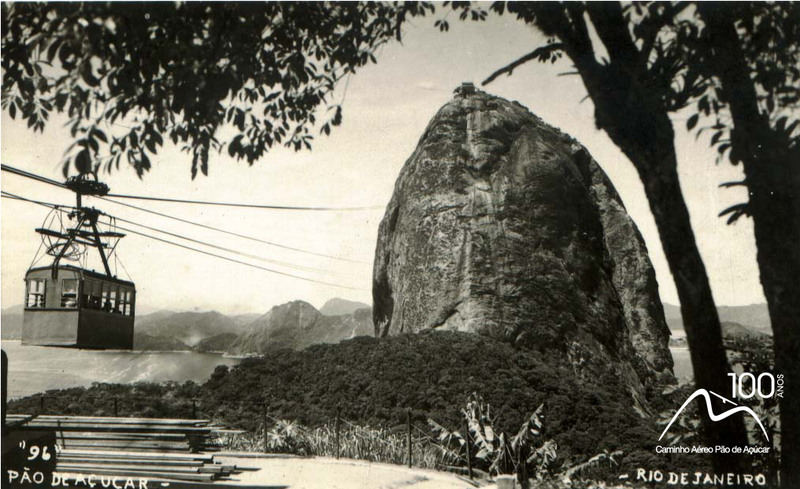 On January 18, 1913, the second stage to the summit of Sugar Loaf was inaugurated and the Cariocas could finally gaze down on the city and appreciate its beauty from above, as Henrietta Carstairs had 96 years earlier. The first cable car system, of German construction, operated for 60 years and transported Rio de Janeiro’s many famous visitors to the top. But the cars, which took six minutes to complete each stage, could only carry a maximum load of 24 people, or 112 in an hour. As the years passed it became abundantly clear that Sugar Loaf’s cable cars could not cope with demand yet it was only in 1969 that anything concrete was done to plan for the future. On May 5, 1970, the then Governor of Rio de Janeiro, Negrão de Lima, gave his permission and backing to a project that would cope with demand “until the year 2000 and beyond”. Work on the new cable car system started on July 13, 1970, and was budgeted at $1.3 million. Two years later, on October 29, 1972, the new Italian system went into action and the old one, which had served Rio faithfully for 60 years and three weeks, made its last journey. The new system raised the number of passengers that could be carried in one hour from 112 to 1360, the new cars carrying in one hour what the old cars took all day to. Carrying 75 passengers in each car, the new system was one of the safest in the world and despite what you may have seen being done to it in the James Bond movie, Moonraker; there has never been a serious accident on the system. The system was further updated in 2009 with the introduction of new bubble-shaped cars manufactured in Switzerland that offered an improved ride and visibility. The cars hold up to 65 passengers and offer 360 degree views. Sugar Loaf (Pão de Açúcar) is a short cab ride from Copacabana and not far from Ipanema. All the main tour companies run excursions and every cab driver, not surprisingly, knows how to find it. The cable cars run daily from 8 am to 9 pm and the longest you will ever have to wait for a car in the low season is 30 minutes but normally it is less, because the cars go just as soon as they are full. There is always a car on the hour and on the half hour. There are two stages in a trip to the summit. The first links Praia Vermelha to Morro da Urca. 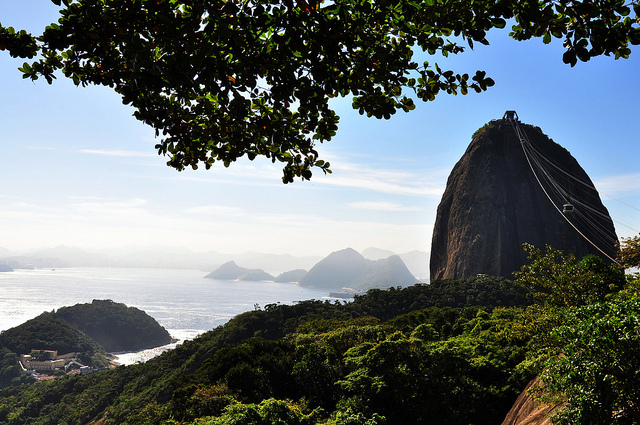 Morro da Urca is the main entertainment center and is where the theatre, nightclub, restaurant and bars are located. At the summit, explore. There are beautiful walks through the gardens at the back, walks that the vast majority of visitors miss for not looking. From the walkways you have the most spectacular views of the mouth of the harbour and along the coast to Itaipú Beach on the Niterói side of the bay. One last piece of advice: don’t rush Sugar Loaf. You can stay up it all day, if you want. Sadly, far too many visitors rush straight up and down without ever appreciating everything Sugar Loaf has to offer and its many different views that change with the light. 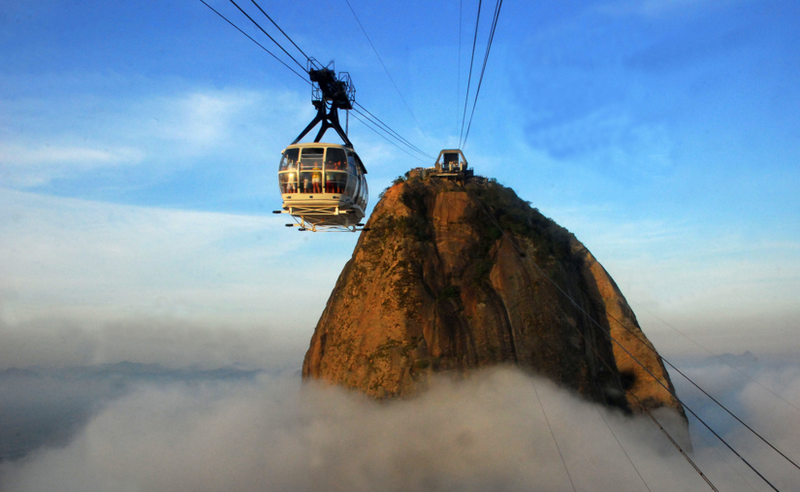 Height: Sugar Loaf Mountain – 395 m (1300 ft). 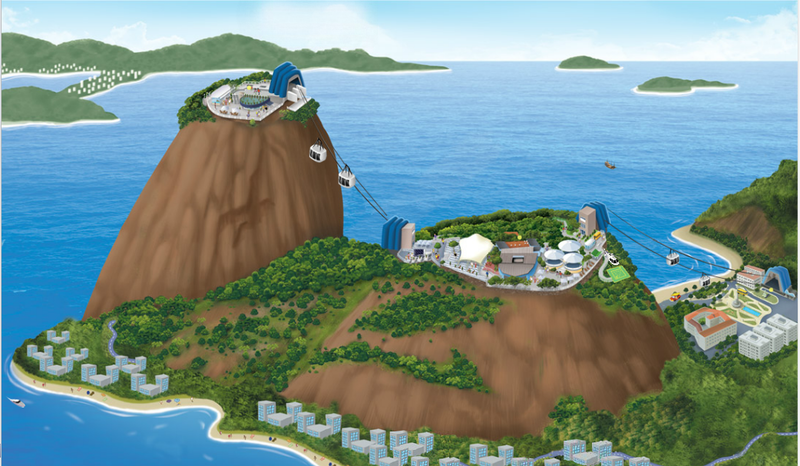 Urca Mountain – 224 m (705 ft). 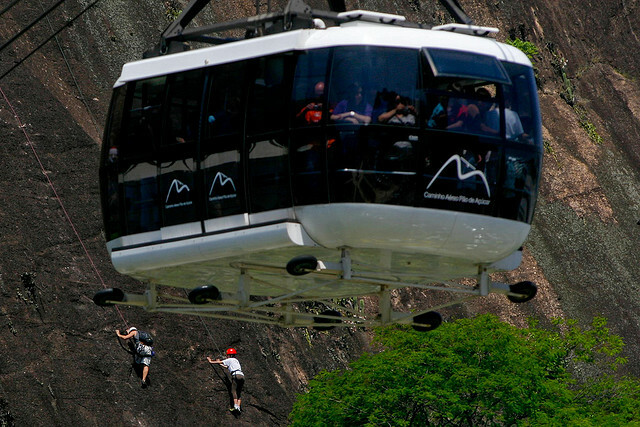 Cable Car Hours: The up cable cars run daily from 8am to 8pm and later when there is a show or event on Morro da Urca. Daily the last car down is at 9 pm. A car always runs on the hour and the half hour. You can buy tickets online in advance by clicking HERE An adult ticket costs around US$25, €20, or £18. Children under 21 are half price. You can pay more and buy a Golden Ticket, that allows you access to a waiting room and to jump the queue. There are also special historic and backstage tours that can be booked online. 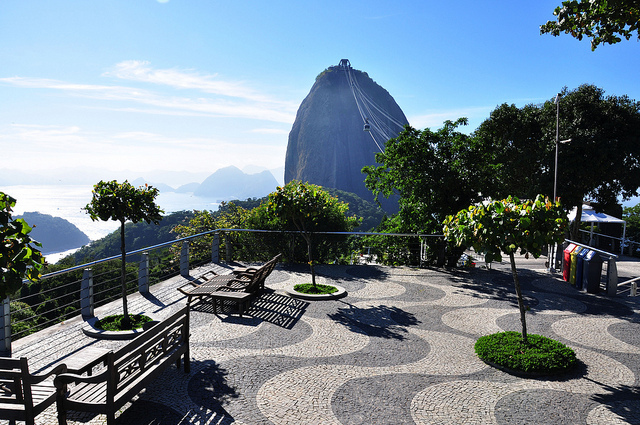 Live Shows: Live shows, featuring top names from Brazil and abroad, take place in the amphitheatre on Morro da Urca. To find out if there is a show and who are performing you should look in the entertainment section of O Globo or the Sugar loaf web site. Helicopter: Morro da Urca has a heliport offering flights over Rio with Helisight that has operated in the skies above Rio since 1970. New Year: Sugar Loaf is a popular option for New Year’s Eve with a lively party, live music, djs and views of the firework displays across the city. Restaurant: The restaurant is normally open daily from noon to 9 pm and later when there is a show. Address: Av. Pasteur, 520 – Urca.